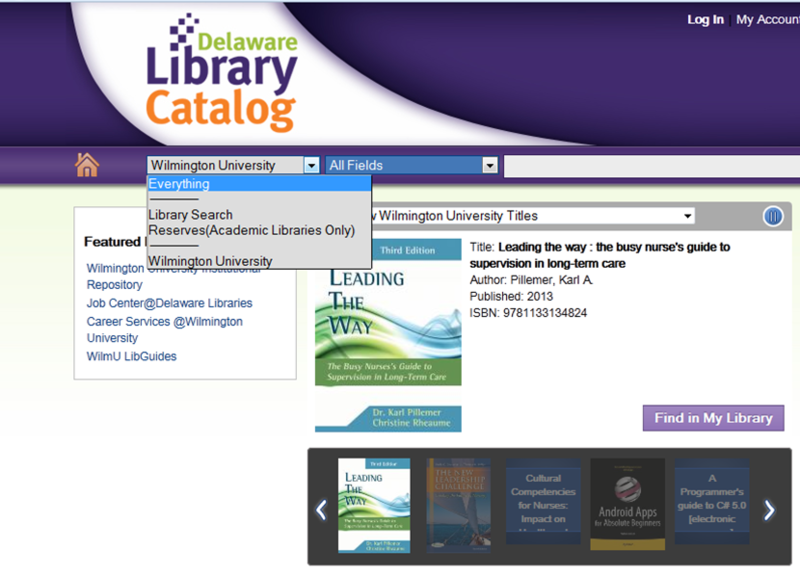 Students, Faculty and Staff are able to borrow materials through the Delaware Library Catalog using the Place Hold feature. To search for materials from the other participating libraries, change drop down box on the catalog search screen from Wilmington University Library to Everything. Additionally, you can search for materials from a specific library on the following Search Results page. Look for the list of Libraries on the left menu bar. 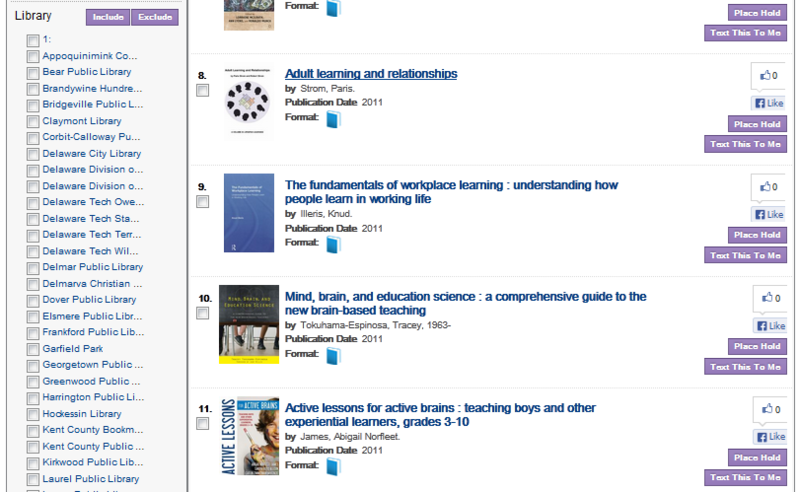 After selecting the library or libraries, click on the Include button. On the catalog search screen change the drop down box from Wilmington University Library to Everything. Enter your search terms in the field above and click search. On the Results list, find the item you would like to request. The Place Hold button is located to the right of the page. A window will pop up asking for your Library Card Number and PIN if you have not already logged in. In the next window, choose Wilmington University Library for the Pickup Library. Then click Place Hold(s). Where can I pick up my materials? Choose Wilmington University as the Pickup Library. Choose Wilmington University as the Pickup Library. However, you may call or email the Library once your material(s) have arrived to have them mailed to your home address. All postage will be covered by the Library. Those in Kent County have the additional option of choosing Dover Public Library as the Pickup Library. Anyone owning a Delaware Library Card has the option of placing a hold through the catalog and choosing any of the system libraries as a Pickup Library. Users must log in/place hold with their Delaware Library Card information.